LSD Overdose - What are the Symptoms? Is it Lethal? LSD Overdose – What are the Symptoms? Is it Lethal? In most cases, LSD overdose happen when people take too much of it. Once ingested, the body rapidly absorbs it into the bloodstream. Then, the blood flow will help it reach the brain. It is available in the form of oral pills, capsules and occasionally liquids. LSD (D-lysergic acid diethylamide acid) is a powerful hallucinogen. It means you can get hallucinations after you take it. Furthermore, the chemical may have effects long after the initial “trip”. Users call them “flashbacks”. In fact, these things can occur for months or years after the hallucinogen use. Presently, it has no known medical use. Notably, we can attribute overdoses to recreational use. Because it is inexpensive, drug abusers are more likely to overdose on it. Unfortunately, Both intentional and accidental overdosing are possible. What are the Symptoms of LSD Overdose? Once you take it, it starts to show the effects within an hour. The symptoms reach their peak after about 2-4 hours. Then, it may last for up to 12 hours after that. Indeed, the symptoms may become more severe when you use it with other drugs or alcohol. How Does a LSD Overdose Affect Your Body and Brain? LSD is structurally similar to one of many potent chemicals in the brain (neurotransmitters). Scientists call it serotonin. 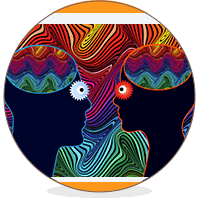 Being that, LSD disrupts the normal function of the serotonin system in the brain. As a result, it leads to altered thinking, perception, mood and emotion. That being the case, this is where you get the hallucinations. Similarly, it also affects the areas of the brain that release Norepinephrine. This is another active neurotransmitter. It has a central role in regulating blood pressure, breathing, heart functions and body secretions like sweating. Therefore, LSD overdose symptoms can range anywhere from fear and euphoria to loss of breathing ability. Consequently, users may pass out from the lack of oxygen to their brain. The strength of samples obtained from illicit sources ranges from 20-80 mcg of LSD per dose which can be easily bought on the streets. This is according to the US Drug Enforcement Administration (DEA). Normally, most abusers get the high they want with a dose of 50-200 mcg. Understandably, one dose of LSD is enough to produce the symptoms on the body and the mind. Low cost: A single dose to get high can cost as low as $2. Potent mind-altering effects: It is effective even at very low doses. Attractive packaging: Most LSD products in the market are packaged in attractive containers. They are small stamps featuring cartoon characters. So-called brain booster: In addition to getting high, some college students also use it to enhance their memory. However, there is no evidence that it can improve your memory. At any rate, Americans seem to have some sort of fetish for LSD. In 2010, 6.4% of young Americans aged 18-25 years had used it at some time in their life. This is according to a report from the Substance Abuse and Mental Health Services Administration (SAMHSA). Oddly enough, there has been no reports of case of death due to LSD overdose. Scientists estimate that a lethal dose is 14,000mcg. Understandably, you will have to take some massive doses if you want to overdose. Reports also indicate attempts of suicide by ingestion. However, they did not result in death, just some hospital visits. Benzos to suppress agitation in patients who do not calm down with behavioral intervention. Blood pressure lowering agents to cut back abnormal perceptions and normalize the blood pressure. Activated Charcoal: if the patient receives the treatment within an hour of taking LSD by mouth. This may help to reduce its absorption inside the digestive tract. Fluid injections to treat very low blood pressure and symptoms of dehydration caused by hyperthermia. Medications to treat bleeding problems: you may need to take blood-thinning agents if you have blood clots inside your body. Do you or someone you know have LSD overdose? Call your local emergency number 911. Or call the national toll-free Poison Help hotline (1-800-222-1222). You can reach it from anywhere in the United States to get the LSD addiction treatment consultation. Looking for professional medical help for addictions? Talk to experts near you. Addiction Resource » Addictive Substances: The Anatomy of Drug Addiction » LSD Addiction and Treatment » LSD Overdose – What are the Symptoms? Is it Lethal?